In their first public appearance since emerging from their ten-day ordeal in the cave, the boys recounted their side of an extraordinary story that captured the imagination of the world. Sitting beside the boys were the Thai Navy SEALs who stayed inside the cave with them after they were found, as well as members of the medical team who looked after them after the rescue. Dressed in matching team shirts, the boys and their coach Ake appeared happy and relaxed as they faced the world’s media. The boys introduced themselves with their nicknames and the position they played on the team. The largely joyous mood of the press conference was tempered, however, when the boys and Ake discussed the loss of Saman Kunan, the former Thai Navy SEAL who had died during the rescue effort. Ake said the team were shocked to learn of Saman Kunan’s death, called him a hero. In memory of the navy diver, Ake and the boys decided to spend time as novice Buddhist monks — a practice considered a high honour in Thailand. The boys thanked their rescuers and medical staff, and paid tribute to Kunan. They also bowed before a portrait of the Thai king. The boys explained as to when they realised that they were trapped, how they adapted to their surroundings and their eventual joy at being found, ten days later. They described their rescue as a miracle, thanked the experts who saved them and discussed how the experience would affect the rest of their lives. Contrary to the belief that the team entered the cave complex to celebrate the birthday of Night on the day the team went missing, Ake said that the boys were merely curious to look inside as some of them had never been there before. He said it was not unusual for the group to participate in group activities after soccer practice on Saturday afternoons. They explored the caves for about an hour, before deciding to return. By this time the cave had become partially flooded and their exit was blocked. All the boys can swim, country to earlier reports, and they to swam to safety when the water started rising. At his point, they realised that they were trapped. With no obvious way out, the group retreated about 200 meter further into the cave to find somewhere to rest for the night. There they found a bit of slope with a small water source, Ake instructed the team to drink water dripping from the roof of the cave as it would be purer than the dirty floodwater on the floor. Having eaten after soccer practice, the boys had no food during their ordeal. Instead, they drank water from the cave. Before they slept, Ake told them to say a prayer and they prayed that night. The team were not scared and Ake hoped the water level would drop the next day, and that help would arrive. The waters did not subside, however. Instead the levels rose fast. Ake ordered the group to find higher ground. Concerned that they might soon be submerged, he instructed the boys to start digging and look for a potential exit. They managed to burrow a hole into the cave in shifts after the water rose by three meter. Adun, the only member who spoke English, responded with a “Hello” in disbelief to the first British diver who reached the group. Adun, like other members of the group, was busy digging — looking for a possible way out — when some of the boys thought they heard the sound of people talking. Ake instructed the group to stay quiet. He asked one of the boys to move closer to the ledge and shine a flashlight on the water, but the boy was too scared, and Adun volunteered instead. 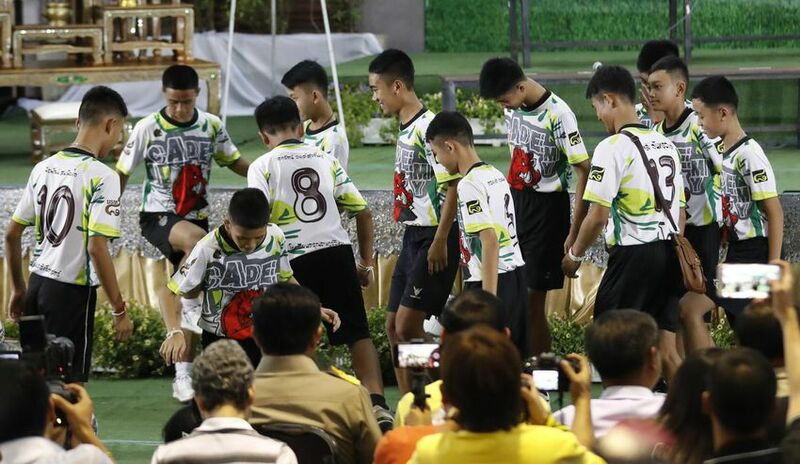 The boys described how they formed a bond with the Thai Navy SEALs who remained with them in the cave while rescuers worked out a plan to free them. They played checkers — and one of the Navy SEALs sitting alongside them at the press conference always won. This SEAL was titled ‘King of the Cave. One SEAL had spent most of the time in just his underwear and a small piece of foil, having stripped off his clothes to give to the boys to keep warm. None of the boys wanted to leave the cave first when rescuers asked for volunteers when the decision was made to extract the boys through the floodwaters. Ake joked he and the boys made the decision on who should go first based on who lived the furthest away. Ake thought the rescued kids would go straight home and those who got out first could spread the word. When asked about the lessons they’ve learned from the incident, Ake said he was going to live life more carefully. Ardun said though people can’t predict the future, the experience had taught him about the consequences of acting carelessly. Other boys said though they still dreamed of becoming soccer players, some said they now wanted to become Navy SEALs. The boys and Ake apologised to their parents for not telling them they went to the cave. Thai authorities are concerned about their long-term psychological health. They urged the media to respect the boys’ privacy in the future, out of concern for their mental health. They are also in the process of granting four team members who are stateless Thai citizenship. The day after the press conference the boys were allowed to go home. Doctors have advised their families that they should avoid contact with journalists for at least a month.